GrillGrates Product Review - Are They Worth the Extra Money? Are you looking for an additional attachment to add to your grilling arsenal to level up your food presentation skills? Grillgrate is a manufacturer specializing in producing grill grates which they claim are better and have the ability to improve significantly your grilling experience. But, are they really different from the standard cast iron or stainless steel grates? Don’t they all do the same thing? How can you improve a grill grate? I decided to put together and do a full GrillGrates review so you will know exactly if you should pick one or not. Note: If you are in a hurry, click here to jump directly to our conclusion and see if the GrillGrates are actually worth the extra money. 3 Are GrillGrates Product Good? 4 How do the GrillGrates Product Work? 11.1 Should I replace my existing grates with GrillGrates or use them on top of them instead? 11.2 Should I remove my flavorizer bars? 11.3 Is Hard Anodized aluminum Safe to Cook on? 11.4 Will my grill run hotter with GrillGrates? GrillGrate was founded in 2007 by Brad Barrett of Cartersville, GA. He decided to manufacturer grill grates after continuously being frustrated by undercooking, overcooking and burning its food while using traditional grates. Since traditional grates have never been a source of innovation, he decided to do some research and produce a grate which improves your grilling experience. And, let’s be honest, traditional grates are very basic. They only function is to hold the food over the fire and not rust. No other innovation and improvement are done to them for years. The patent from GrillGrates LLC is based on a rail design over a bottom with holes in it, to deliver a more controlled grilling experience. As you may already guess, GrillGrates products are designed and Made in the USA. Grillgrates are a cool invention made of hard anodized aluminum material with interlocking panels who sit on top of your current grill grates. They come in various lengths and shapes to fit any grill on the market. The aluminum panel amplifies the grill heat and converts it to infrared heat. The aluminum material is better in distributing the heat evenly across the surface, much better than the steel or cast iron made grates. Each Grillgrate is usually made of three interlocking pieces, with each plate being flat with five raised rails. Each panel has several holes in the bottom to allow the hot air and heat to rise and reach the food on top of them. This type of design makes the surface gets very hot but distributing the heat evenly to the food, without causing hot or cold spots, found very often in traditional grates. According to the manufacturer, these grates are capable of amplifying the temperature of gas grills by 200°F and pellet grills by 150°F. And for those who want to cook on extremely hot surfaces or directly on metal, just like a griddle grill, then you can actually turn the Grillgrates product upside down and use it on the other side. The holes will still allow the heat to spread evenly and you can easily sear or cook your food over high-heat metal. One other great benefit of these grates design is the feature to completely block flare-ups and prevent burning. The small holes in the bottom are enough to block the fire and prevent food burning. And they also prevent smaller pieces of foods and debris to go and slip through the grates and end up in the burners or being lost forever. 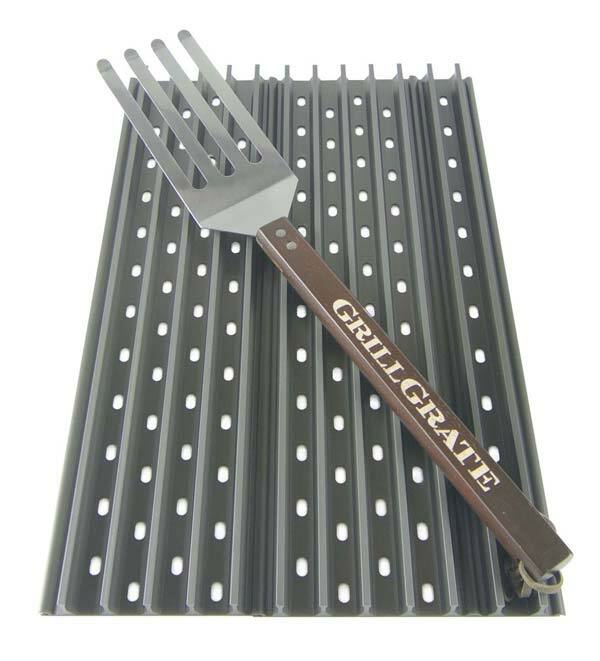 Grillgrates also include a cool attachment with their grates, a custom GrateTool spatula, made of stainless steel, with four fingers to perfectly fit in the grates rails. It can easily slide between the rails to pick up pieces of foods without having to scrape under them. Their manufacturer claims that their grates are capable of producing more juicer and delicious food, with restaurant-quality sear marks. They also claim that their unique design of valleys between the rails collect the food drippings and vaporize and sizzle them into flavor and moisture for the food. They call it a Flavor Enhancing System. Two other claims from the manufacturer are that these type of grates are supposed to be easier to clean and the combination of their GrateTool spatula with the rails design makes flipping your food very easy. When I first came across the GrillGrates, I thought that there would be no major difference with the traditional grates. After using them for a while, I noticed several differences with the traditional grates which my grill comes with. And, to legitimate my findings, I entered several communities online and a lot of people saw an improvement in their grilling experience after installing these type of grates. They work great on any type of grill: Gas, Pellet or Charcoal Grill and with any type of food. They actually reduced the pre-heating time on my old grill by maybe around 20% and actually made my grill more fuel-efficient as the grill was using the heat more evenly and was retaining the heat longer. After I picked my preferred size, the installation was pretty easy. The three pieces snapped together easily and you don’t need to do any other preparation or assembly. Just three simple panels snapped together and you are ready to go. At first, I decided to put them on top of my actual grates and later on, I tried cooking directly on them without traditional grates beneath them. The results were very good in both cases. I tried grilling vegetables, burgers, steak & bacon using the grates on both sides; as rails and as griddle-style grates. They blocked the flare-ups, especially when you cook meat cuts richer in fat such as burgers or some specific type of steaks. Also, the rail side gives your food a nice sear mark without leaving any overly charred spots, which I think is very important for any of you who think that food presentation is crucial. The included GrillTool spatula made the food turning and transferring pretty easy. You can easily catch, handle or flip the food without much effort and without doing any mess. In the end, the cleaning process was as easy as running a soft-wire brush over the rails while they are still hot and using the spatula to scrape any debris. How do the GrillGrates Product Work? The science behind GrillGrates is that they cook your food by conduction, hot air and radiant heat (just like infrared grill concept), making your food juicier and more evenly cooked. They act like a magnifying lens on top of the grill’s actual burners. They focus the heat by converting it into infrared heat and at the same time, transferring it evenly across the surface. The manufacturer state that the temperature will get 100-350°F hotter than the temperature originally set on the dome of your grill. The hole-bottom design of the GrillGrates blocks any flare-ups from food fat, preventing the food burning and hot spots. The highly conductive aluminum material allows the heat to spread across the surface rapidly and more efficiently than a cast iron or stainless steel material. This will improve the food cooking times and prevent hot and cold spots. The rail design will allow the juices and drippings which fall into the hot surface to sizzle and transform into flavor for the food. They call it a flavor enhancing system. The rail design and the even heat across the cooking space will give you steakhouse quality searings every time you cook your foods. You are free to control them based on your preferences. After you review the previous customer reviews, mostly on Amazon, you will notice that they have overall high ratings, averaging 4 and a half stars out of 5, which is pretty good. Their most sold product, the Set of Two 13.75” GrillGrates + GrateTool is priced very affordable and can be a great fit for the average grill enthusiast. Several people complain about the cleaning process. They thought it would be easier to clean them after each use. You have to be prepared that you still need to do the traditional cleaning process with scrubbing and sometimes, using soapy water to get them perfectly cleaned. However, almost all previous customers state that they are still easier to clean than their traditional grates. Also, there are people who complain about the grates getting too hot and sometimes burning their food. These grates are not heat proof. They will still transmit the heat from the fire to the food. If you set the grill to high settings or the put lot of charcoal in the fire pit, the increased heat and fire will be transmitted to the food, eventually burning it if you are not careful. Reducing/Eliminating Flare-Ups: Their patented design eliminates the very common flare-ups in traditional grills. The rails amplify heat while aluminum material conducts heat efficiently to eliminate hot and cold spots. Rust Proof: The highly conductive hard anodized aluminum material used in these grates make them rust proof. Even-Heat: Even distribution of heat across all cooking surface. Sear Marks: GrillGrates provide you with quality sear marks every time to make your food presentation on point. Some people have a hard time cleaning up: The rail design sometimes may require a bit more effort to clean than a traditional grate. You can use the included spatula for easier cleaning. They may get too hot: You have to be careful to not set the temperature too high and burn your food. These grates will produce 100-150°F extra of the grill temperature. So, if you need a 500°F cooking temperature, set the grill at 350-400°F and the remaining heat will be produced by GrillGrates. If you have an indirect heat source grill, such as a pellet smoker or ceramic grills like Kamado or Big Green Egg, then this will be a good product to add on top of your existing grates. The main reason is that the GrillGrates will eventually heat up from the indirect heat and will allow you to get some great grill marks and cooking even when using such grills. You can use GrillGrates on top of your existing grates or remove the old ones and put these instead. If you have porcelain grates or steel grates which are already rusted and you are planning to replace them, then you should consider picking this product. GrillGrates are perfect for someone who hasn’t much experience in outdoor grilling or has just started. They will help you with the heat distribution, will prevent big flare-ups and save your food from burning. You don’t need to replace and maintain your grates anytime soon and will help you to not throw or lose food between grates or falling into the fire. As for warranty, GrillGrates offer a 100% Money Back Guarantee. Each of their product is backed up by 30-Day money back guarantee and 90-Days product return no question asked, so you are free to test and see if they fit your preferences or not. After the detailed review, we think that GrillGrates are a very good upgrade to your existing traditional grates. They do a great job in distributing the heat evenly across the surface, offer you the versatility to be used as a griddle or grill grates, eliminate flare-ups and hot spots and give your food perfect sear marks. They are an excellent option for both, the beginner and the bbq pit-master to step up their grilling game. Should I replace my existing grates with GrillGrates or use them on top of them instead? It totally depends on you. They will work great in both cases. You only have to watch the temperatures because when used as replacement grates, they may get hotter than the actual set temp. Should I remove my flavorizer bars? No, you don’t have to remove your grill’s flavorizer bars. They act as a flame shield and to avoid hot spots, so there is no need to remove them. Is Hard Anodized aluminum Safe to Cook on? Hard anodized aluminum material is totally safe to be used for cooking. It has an extremely long life span. It doesn’t chip or peels and it’s used to protect satellites from the harsh environment of space, for automotive racing parts, as well as for display cases, coolers, and grills for the food industry. Yes, GrillGrates will distribute and use the heat more efficiently, which results in more temperature on the surface. They usually run 100-150°F hotter than the air temperature in the hood, so you better keep an eye on the temperatures.